Attendees at the Service Recognition Reception were among 56 faculty and staff employees honored for their work totaling 1,015 years of service. (NEW ALBANY, Ind. )—Chancellor Dr. Ray Wallace and campus leaders acknowledged the contributions of faculty and staff at this year’s service recognition reception. In his opening remarks, Chancellor Wallace noted that the group of employees ranging in age from 34 to 77 had devoted a total of 1,015 years of service to the university in administrative, teaching, maintenance, advising and other roles. Chancellor Wallace, Executive Vice Chancellor for Academic Affairs Dr. Uric Dufrene, Vice Chancellor for Administrative Affairs Dana Wavle and Interim Vice Chancellor for Enrollment Management and Student Affairs Amanda Stonecipher recognized individual milestones in their respective areas. Biographies revealed an energetic and eclectic community with a shared dedication to building IU Southeast into a pre-eminent institution over time through a devotion to the core values of creating a nurturing environment, holistic learning, integrity and connectedness. Two staff members, Phyllis Nachand, acquisitions assistant in the IU Southeast library and Mark Kessinger, grounds and landscape staff, have sustained that devotion for 40 years. Saundra Gordon, manager of General Studies, has been with IU Southeast for 30 years. Dr. Johanna Goldstein, professor of music, and Dr. Richard French, professor of accounting, were recognized for their 35 and 30 years respectively. 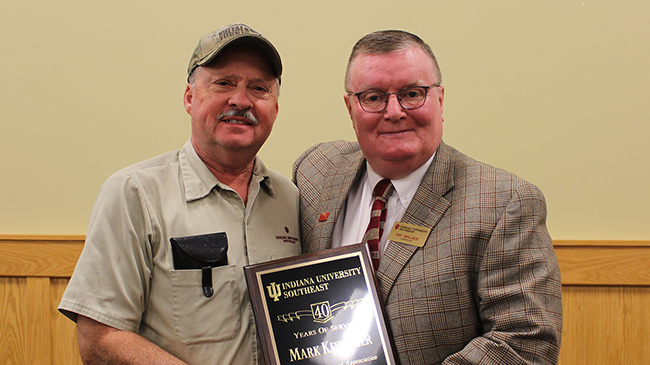 Mark Kessinger, grounds service staff, receives a recognition of his 40 years of service from Chancellor Dr. Ray Wallace. 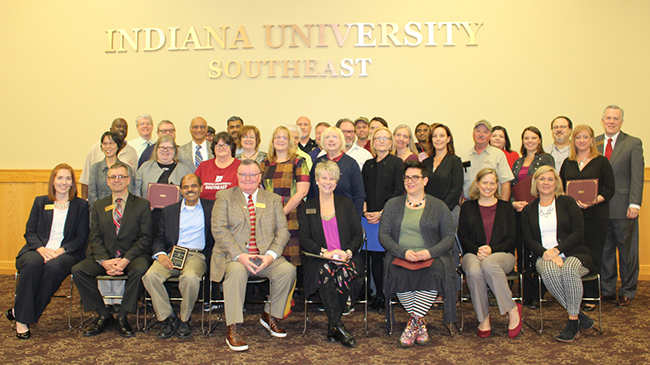 The Service Recognition Reception is organized by the IU Southeast Office of Human Resources. Homepage photo: Phyllis Nachand, acquisitions assistant in the IU Southeast library, receives a commemorative plaque honoring her 40 years of service to the university.